Shipping info: Free shipping within the EU. All other countries are subject to additional duties and charges. 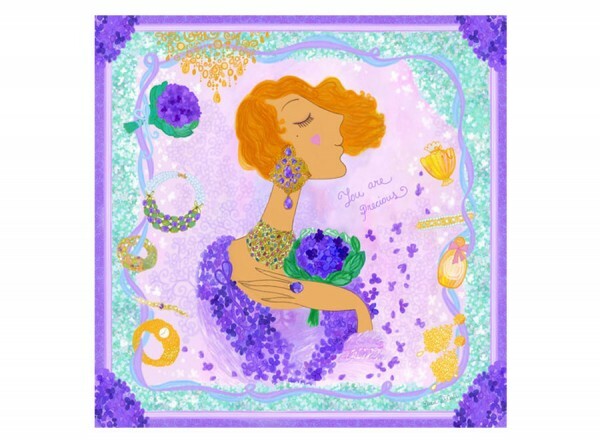 Product information "Purple Silk Scarf Precious"
We have such an adundance of beauty surrounding our lady Precious on this scarf from our G&H parter Daria DiCieli. Silky hues of gold, blue, green and purple. Purple being a colour so rare in nature that it was only ever worn by royalty. Stunning necklaces, earrings to match, her favourite perfume, lady Precious simply cannot decide what to choose. She is getting ready to meet an old friend and as she takes the violets in her hand, their scent fills her with memories. She closes her eyes and is reminded; the most precious things in life are not things at all. Oh dear, the watch says after nine! Time to go! Related links to "Purple Silk Scarf Precious"
Customer evaluation for "Purple Silk Scarf Precious"